This post is part of my personal challenge to bake my way through all the challenges of the Great British Bake Off. 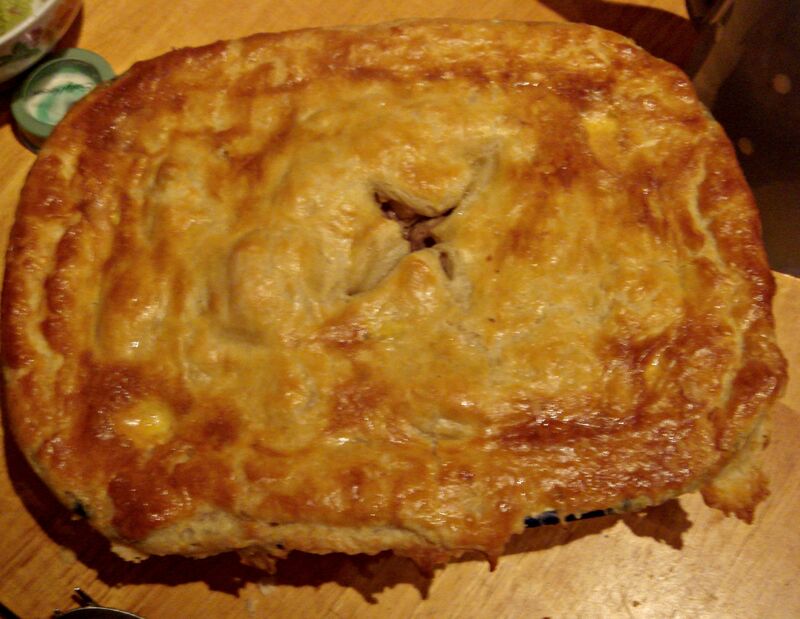 The challenge below is the signature challenge for week five (pastry week) of series two: make a hearty family pie with rough puff or flaky pastry; no pastry base. This savoury pastry dish combines two family favourites: pie and stew. I actually made much of this recipe up, as I got it into my head that I wanted to make an Irish stew pie (not least because I was serving it to friends, one of whom doesn’t eat beef but loves lamb), and none of my cookbooks yielded a recipe. In fact I thought I’d made up the concept completely, but Darina Allen refers to it in her magnificent Irish Traditional Cooking, although she found the recipe in a manuscript cookbook and says that she’s never heard of it in any other place. The recipe Darina offers up is very plain – meat, potatoes, onions – but my version is more colourful with vegetables (including carrots, which seem to be a controversial ingredient in Irish stew), although I think it retains an authentically simple flavour profile: just salt, pepper, parsley – and the parsley needn’t even be flat-leaf if you don’t mind (not that it’s easy to get hold of curly parsley anymore). The pie had substantive gravy (though it was thin – you will need to add thickener of some description if you would like it more gelatinous) and was utterly delicious: hearty, satisfying, quite warming, yet light and wonderful to eat. I thought it was really ideal for early spring, when the body starts hankering for lighter, brighter flavours but actually it’s still pretty cold and you need something that will stick to your ribs. The flaky pastry recipe I used was from Delia Smith. I don’t always turn to Delia instinctively but this recipe is absolutely perfect, utterly simple, and explained very well (I find some Delia recipes quite pedantic and prescriptive). I have used this one for a number of years and frankly I think it is unbeatable. People always compliment me on the pastry when I make this version, even though it is very simple to make. The recipe produces light, delicately flaky layers, and many people mistake this flaky pastry for a much more involved puff pastry on account of how crunchy, buttery and multi-layered it is. Indeed the friends who I served the pie to thought it was puff pastry, and both are experienced bakers. I suggest that you tuck up the recipe and use it for all manner of things: rough handheld fruit pies, sausage rolls, apple turnovers. I think the flavour profile of the basic stew filling could be adapted in numerous ways. If you added a little garlic, maybe some thyme and rosemary and a splash of lemon juice, the flavour profile would be much more French. A handful of olives, diced plum tomatoes, maybe some feta, would give it a Mediterranean edge (though you might want to leave out the turnips). Add juniper, nutmeg or mace and maybe even a splodge of gin for a northern European, Nordic feel. You will need a pie tin – I used an 18x14cm oblong enamel pie tin for that traditional, country-kitchen feel. Conducts heat well, too – and is cheap! You will need the butter to come straight from the freezer, rock-hard, so weigh out 125g, wrap it in plastic wrap or foil and pop it into the freezer for 45 minutes. When ready, sift the flour and salt into a large bowl. Remove the butter from the fridge and either remove the wrapping or peel the wrapper back and hold the butter in the folded-back foil or plastic – it will protect the butter from your warm hands, as Delia says, but will also protect your hands from the ice-cold butter! Using the coarse side of a grater, grate the butter into the bowl directly over the flour. Dip the edges of the butter onto the flour several times to make it easier to grate. You will end up with a large pile of grated butter in the middle of the flour. Take a palette knife (or normal knife) and start to distribute the gratings into the flour without using your hands. Try to coat all the pieces of fat with the flour. Sprinkle a tablespoon of the cold water all over the mixture and continue mixing with the palette knife. Add a further 1-2 tablespoons of water and mix as before (I almost always end up needing to use a little extra water but go slow). Bring the mass together with the palette knife and finish off using your hands. The dough should come together, leaving the bowl fairly clean, with no loose butter or flour anywhere. If you need more moisture to achieve this, dab a little through with your fingers. Pat together into a round, flatten it gently, wrap in plastic wrap and chill for at least 30 minutes before using. If your stewing lamb has come in large chunks, dice the chunks further until fairly small. Dice the onion and set aside. Dice the peeled carrots and turnips and set aside together. The chunks of vegetables should be about the same size as the lamb chunks, or a little smaller. Dice the peeled potatoes and set aside. On a medium heat, melt 1 TBS butter in a pan large enough to hold all of the ingredients. In batches, if necessary (depending on the size of your pan), sear the stewing lamb pieces on all sides. Set aside on a plate. Turn the heat to medium-low. Add the additional tablespoon of butter, if necessary, and add the onion. Fry until aromatic, about 5-7 minutes. I like the onion pieces to catch a little and turn golden at the edges. Turn the heat to low. Add the carrots and turnips and turn about in the hot fat for 2-3 minutes. Add salt and pepper to taste, being mindful that store-bought stock may be salty. Return the lamb to the pan. Very carefully, add enough water or stock to only just cover the meat and vegetable mix. If using a stock cube or base, now is the time to add it. Add the potato chunks. Raise the heat to high and bring to the boil. As soon as the stew mixture boils, turn the heat down to low and partially cover the mixture. Let simmer gently, stirring occasionally, until the meat and vegetables are tender. My lamb only needed about half an hour. Add the chopped parsley and, once cool enough, taste the stew for seasoning and add salt and pepper. 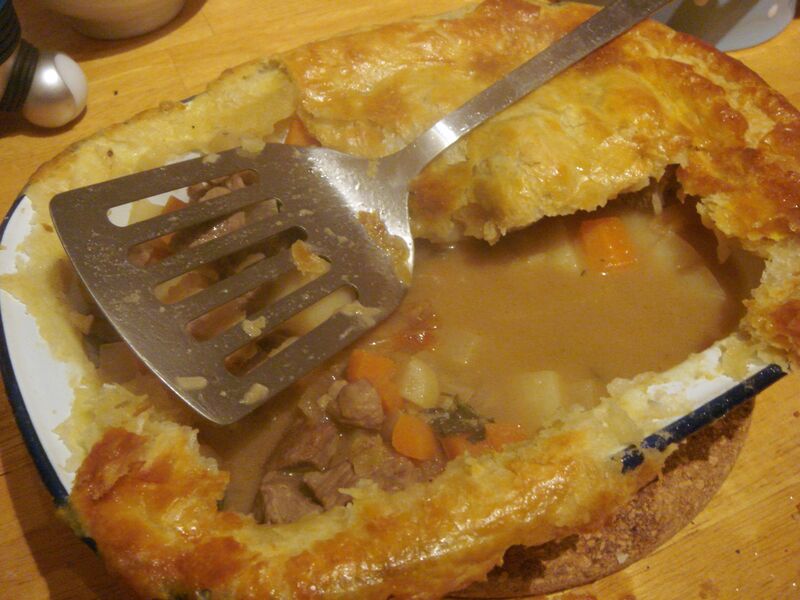 Gently pour the stew filling into the pie dish of your choice – I used an old-fashioned enamel pie tin. Let it cool a little, as if it is too hot it will melt the pastry and make it soggy instead of crisp. Meanwhile, preheat the oven to 220C. Take the pastry out of the fridge and roll out until it is about 2mm thick, rolling into a shape appropriate to your pie tin; mine was an oblong. Depending on the dimensions of your tin, you may have too much pastry for this recipe; just trim it away. Ensure the pastry you have rolled out is only slightly larger than the dimensions of your tin. Take a pastry brush and dip lightly into the beaten egg. Brush over the edges of the tin where the pastry will touch it, again using a light hand. Lift the pastry with your rolling-pin and drape it gently over the meat filling. Trim any overhang using a sharp knife so that the pastry just covers the rim of the pie tin. Press the pastry gently into the rim of the tin. Again using a sharp knife, cut a hole or cross into the centre of the pastry, to allow the steam that will generate when it bakes to escape (cutting a steam hole leads to crisper pastry and prevents the juices from bubbling out). Brush over the beaten egg to glaze, making sure it doesn’t drip down the sides of the tin. Place in the oven on the middle rack and bake for 20-25 minutes, until the pastry is golden and has puffed up (if it needs a little more time, keep a close eye on it). Remove from the oven and serve hot.